What does it take to become aware of something? If recent research conducted with monkeys is anything to go off, the front part of your brain deserves a lot of credit. The prefrontal cortex (PFC) is the most evolutionarily recent part of the brain. It’s a thin but dense wrinkled layer of neurons on the surface of your brain, sitting just behind your forehead. In the previous article, I wrote that the PFC allows us to ‘learn the rules’—for instance, you need a functioning PFC to switch from sorting cards based on color to sorting them based on shape. Turns out its location and function also make it an especially important area in consciousness too. The study examined the neural correlates of awareness in monkeys by taking them through a visual task and measuring their brain activity. When the monkeys’ eyes moved to an image being displayed, the researchers knew they were aware of it. If the eyes failed to move, then the signal failed to reach awareness. They found that visual information had to propagate to the prefrontal cortex to pass a threshold for ignition, after which the signal could maintain itself through a self-sustained pattern of activity throughout the network. It seems that an image must make it past the eyes, to the visual cortex, and then to the front of the brain, if the monkey is to be aware of what’s going on. But the signal can be lost at several points along the way. Another study found that weak signals would enhance local circuitry instead of the long-range networks seen during ignition. At lower doses, anesthetics also promote activity in local circuits at the expense of long-range connectivity, adding another level of support to the hypothesis. The brain rarely does nothing, and its baseline activity is also relevant here. Basically, sometimes you see things that aren’t there and other times you miss things that are. But instead of waiting around for these signals to impinge upon our eyes, it is also the case that we can form expectations that then drive our perception. It may be the case that expecting something to occur raises the level of activity in networks responsible for detecting that something. By doing so, it could bias our perception to find that something even in ambiguous circumstances. You can hear “Brainstorm” or “Green Needle” based on whichever one you think about. Communication in the brain comes in two varieties—excitatory or inhibitory. 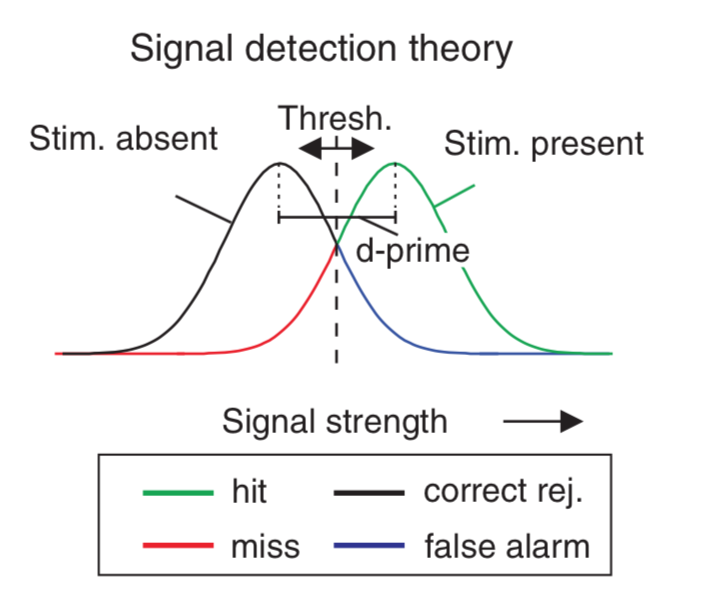 Some signals make it more likely that other neurons will fire, others make it less likely. Using these mechanisms, the PFC—which maintains channels with many different brain regions—is capable of keeping some networks online while suppressing others. This would explain why we hear ‘brainstorm’ when we expect it—we’re enhancing activity in the ‘brainstorm’ network while suppressing activity in the ‘green needle’ network. But, why is it that we can’t hear both at the same time? Thus, if clarity of mind is important, a few precise patterns is better than a bunch of competing patterns. The PFC, it seems, is the trigger to awareness. Any thought that pops into your head likely passed a small obstacle course in doing so. And when it arrived, it found a sparsely populated mental workspace, where a few thoughts mingle together before being replaced by a few others—which others? That depends on what the proceeding thoughts lead you to expect, and, of course, what you physically experience.